"This subtly sweet, fairly fiery shrimp ragu served over my creamy corn custard would make a fantastic first course for any dinner, and it's certainly rich enough to be enjoyed as a entree. You can also pour this over rice or noodles with complete confidence." Stir shrimp into sauce and toss with chives. Serve shrimp with sauce. See how to make spicy shrimp ragu served over sweet, creamy corn custard. 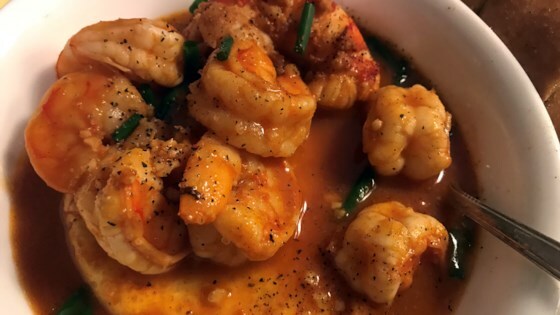 Serve this shrimp on Chef John's Creamy Corn Custard. To serve with corn custard, unmold a ramekin of corn custard into a deep soup plate, surround with shrimp, place a shrimp on top of the custard, and drizzle with sauce. Makes 4 appetizer servings or 2 main dish servings. OMG! That was off the charts! Excellent! We loved it!! I did not change a thing! I did not need to! All of John’s recipes have been great.